Do you want to live a better life, but just can’t seem to do it on your own? Life is a constant juggling act - no wonder you may feel overwhelmed and not able to focus on what you really want. Between family, your work, chores, errands, and your social life there isn’t much time left for YOU! You may feel exhausted, lost or even hopeless about your future – leaving you unfulfilled, but knowing deep down that you want more out of life. Maybe you have mountains of regrets like I did for over 20 years. It’s not a fun place to be. No matter what your current circumstances are, we’ve all been there at one time or another. Usually, it’s just a temporary situation, but can become catastrophic if you get stuck there. No great entertainer, athlete, or CEO of a major corporation does it alone. They all have coaches guiding them along the way. Helping my clients transform their lives is my favorite thing to do. I have been successfully helping thousands of people globally over the past 20+ years, and I would love to help you also! People come to me for many different reasons, but the common denominator is that they’re craving something MORE out of life than they’re currently experiencing. As a Life, Health and Weight loss Transformation Coach, I help busy people just like you push through the struggle and come out on the other side more successful, much happier, and living a very fulfilled life. Getting everything you want in your life is very attainable... once you follow the map to success. My coaching will eliminate painful trial and error frustration and replace it with a step-by-step approach that will give you the BIGGEST outcomes and lasting results. It could also potentially save you years or even decades of your valuable time, so you can start living your BEST life as soon as possible. If Melinda could do this, so can you. To start living a life that truly is limitless, join our next Coaching Group. Schedule your FREE Coaching Consultation today! Imagine waking up in the morning with a big grin on your face, feeling inspired, energized, and excited about your life! If you're not currently experiencing that, you can be! I'd love to help you prioritize the things that are truly important to you, while releasing any stress, fear, anxiety, or negative thoughts and emotions that may be causing you to sabotage what you want most. With my 100% personalized assistance, we’ll work together to transform any areas of your life that you want to improve. Using a caring and non-judgmental environment of support and encouragement, it starts with me helping you get crystal clear about what you really want in your life. Once we’ve established your vision, I’ll help you identify those invisible forces that have caused you to sabotage your success in the past. Then I'll help you shift your mind, will, and emotions so you can transform your life and be propelled as fast as possible to accomplishing your goals. *To see if I'd be a good fit for a Life Coach for you, click HERE to schedule your FREE Coaching Consultation today! "I'm so glad I found Angela when I did. I was having a hard time moving forward in my life and couldn't figure out why. She helped me discover what was going on deep inside and come up with a simple step-by-step plan that was easy to follow. After the first session I could see the light at the end of the tunnel, and now have been able to accomplish many of my goals in a short time. I have such a hope filled attitude now and am the happiest I've been in my entire life. It's as if huge weights from my shoulders have been released and I feel I can finally soar. Thank you Angela!" Priscilla V.
"Angela has helped me pinpoint the things in my life that I did not even know were holding me back from success in life. I have been participating in the Coaching sessions and it has been a game changer with respect to my emotional health. I never knew the impact of how emotional growth can result in fast-tracking your fitness goals as well. The mind plays a huge part in how we approach any circumstance in our lives. Her keys to healing are something that everyone can benefit from in all aspects of their lives. I have done therapy sessions and counseling, and none of them have even come close to the growth I have been able to achieve with Angela. I know without a doubt that she can help anyone achieve their goals in life no matter how big they are. She values her clients and always make sure that they are receiving the support they need and she is highly professional. I would recommend her to anyone!" Tristan S.
Are you experiencing vibrant health, or are you in need of healing? The truth is that you can be whole in every way. I honestly believe that EVERYONE should have a health coach as this is the foundation for a healthy, happy and healed life. I was very sick, depressed and had excruciating pain in my back and neck for over 10 years. Due to receiving freedom from these ailments in 1994, I gave my life to finding every key I could to help others transform their body and their lives. As I incorporated a wholistic and all-natural approach over the years I've been able to help my clients get true transformation and healing as we address each part of their being - mind, emotions, body and spirit. One of the major keys I use to assist my client's gain better health is by going to the root of stress. According to the CDC stress is at the root of up to 90% - 95% of sickness and disease, which affects every area of our lives. While it's true that you cannot always control the things that happen to you, you can control how you respond to it. I will show you how to break free from the negative side effects of stress and how to find more peace and vibrant health in your life. Additionally, for those who are interested, I will help you address your health wholistically including proper nutrition, and supplementation. Having seen multitudes of people healed, I know that these keys can help you experience healing beyond what you can imagine. *To see if I'd be a good fit for a health and healing coach for you, click HERE to schedule your FREE Coaching Consultation today! "I've had Angela coach me over the past 10+ years and she has been able to help me find true healing as we looked at my mind, will, emotions, body and spirit. I highly recommend her as a health coach, and have sent many friends to her for help with life and weight loss coaching as well." Brittney L.
"I needed an overhaul, and I received it being with Angela as she helped me address every part of myself. It has been so liberating and I'm feeling better than I've ever felt." Steve C.
Are you tired of carrying around that extra weight, and want the freedom to wear anything you want? Or are you tired and need more energy? I have found that nothing tastes as great as being thin and healthy feels! Feeling vibrant, healthy and energetic is now one of the favorite things I love about my life. Since then I have helped thousands of individuals globally lose a lot of weight while transforming and sculpting their bodies. When I found individuals that still couldn't lose weight, I realized that they needed the other keys that I use for my clients to transform their minds, emotions, spirits and bodies. As I've taught them how to deal with the stressors in their lives, and discover new healthy ways to give them that same “high” as food did, their addiction to food was broken. One of the reasons I believe that so many people struggle with their weight is because they’ve not yet discovered these keys to freedom. So, if you’ve tried everything to lose weight, but still have been unsuccessful, I encourage you to HOPE. If I did this, (and I did), You can too! All of my clients agree that taking that leap of faith was one of the greatest decisions they ever made. If you want to lose weight fast, while reducing your appetite and cravings, you'll want to add Turbo Sculpt to your weight loss coaching program. However, if you already have something you're currently using successfully to lose weight, you can stick with that. I'll still be happy to coach you, as it's the "missing link" to successful and permanent weight loss. *To see if I'd be a good fit for a weight loss coach for you, click HERE to schedule your FREE Coaching Consultation today! "COULDN'T HAVE DONE THIS WITHOUT THE COACHING!" "I was skinny until about 20 years ago when I went through some emotional things in my life and turned to food. Before I knew it I had gained almost 50 pounds. Over the years I quit every diet I tried and thought I'd be overweight for the rest of my life. 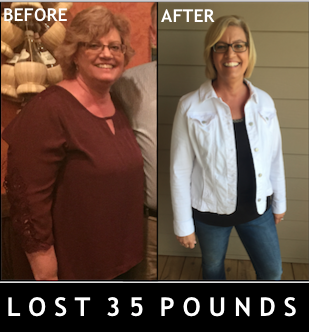 With Angela's Coaching Program and Turbo Sculpt I lost 36 pounds and 39 inches in a few months. I'm so grateful to Angela as she has been on this journey with me every day, every step of the way. This was the best investment I could have ever made in myself and was exactly what I needed. There are many coaches, and coaching styles out there. What makes me different is that I have over 2 decades of experience in helping individuals transform using a wholistic approach which addresses every part of our being - mind, will, emotions, body and spirit. I truly care about each of my clients and will work very hard to help you accomplish every goal you have. I’ve been helping individuals like you for 20+ years and provide a safe – confidential place for you so you can truly transform. Open and honest communication is extremely important to developing a strong coaching relationship. I will be available to help you every step of your journey. I believe I can help anyone. That’s why I give my clients a complimentary 1st coaching session so they can feel confident and comfortable with me. It gives me much joy to have been able to successfully transform thousands of individual’s lives like you for 20+ years. Some of them have been extremely distressed, abused and hopeless. I count it an honor to have helped give each of them the same hope I received. It’s been one of my greatest joys to help individuals heal and be able to move forward so they can enjoy the life they want and deserve. To discover if my coaching is right for you, Schedule your FREE Coaching Consultation today! Join our group to stay posted about upcoming registration dates as well as huge discounts, amazing recipes, and great tips and tricks!